Children and youth have a legal obligation to attend school. School environments, especially public schools, should be designed and managed for this special population as high-quality environmental equalizers for students from a range of socio-economic backgrounds, including the growing population of pre-K children. As this ideal is far from being realized, it begs the question: is a school just the buildings? Outdoors is fundamentally different to indoors, in the way it is perceived and used by students. Outdoors can be designed to offer a broader range of attractive behavioral affordances than indoors. A rapidly growing body of research sheds light on those differences. This session will demonstrate how to translate research findings into actionable design and management approaches that could radically change ways in which student, parents, and teachers perceive and use schools. Varied approaches to new construction and renovation will be discussed. Whole school policies and practices will be discussed to promote school grounds as healthy, educational places for enjoyment, positive social relations, and learning about ecosystems and human dependency on nature. CALLING ALL NATURE PLAY ADVOCATES! 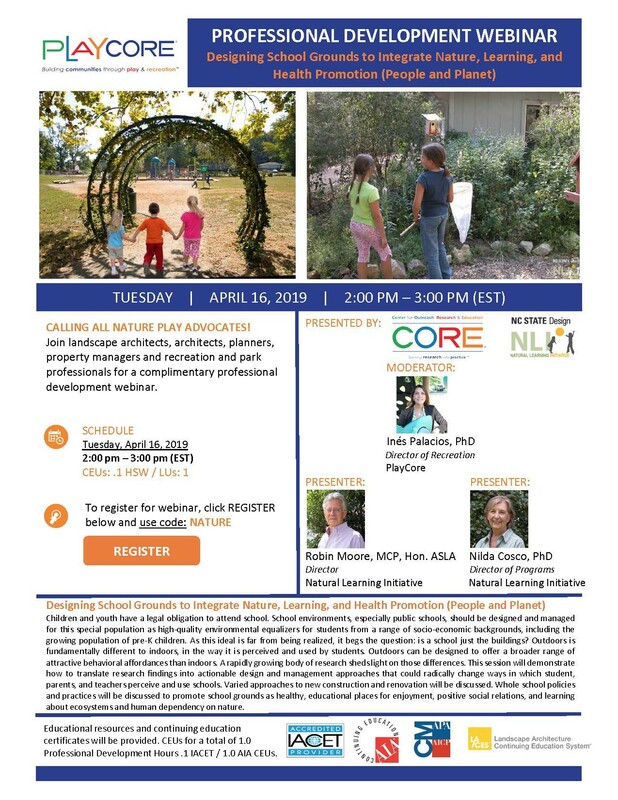 Join landscape architects, architects, planners, property managers and recreation and park professionals for a complimentary professional development webinar.